After a huge cheating scandal that sent allegations—as opposed to Counter-Strike's normal weapon of choice, bullets—flying, this weekend's DreamHack 2014 pro finals produced one of the best matches Global Offensive has seen. It nearly didn't happen, however, thanks to, yep, more cheating. In the wake of Valve's discovery that three high-profile pro Counter-Strike: Global Offensive players used hacks/tools, all eyes were on DreamHack this weekend. Two teams, Titan and Epsilon, were banned from competing outright, so people figured players would do their best to minimize shenanigans. They were right, mostly—except when they were very, very wrong. The weekend's big controversy came when infamous mega-team Fnatic found themselves dangling from a thread after a beatdown from eventual competition winners, LDLC. Matches were made up of two sets of 15 rapid-fire rounds, and LDLC was up 12-3 at the start of the second half. A few more rounds, and a comeback from Fnatic would've been impossible. So, under the white-hot lights of a community practically launching scrutiny lasers from their eyes, Fnatic whipped out its secret weapon: a thoroughly illegal exploit. This from a team receiving perhaps the most skepticism of all in the wake of the big cheating scandal, with the Internet digging up everything it can about a couple of the team's players. tl;dr? Not a smart decision. Here's where things get especially nutty: Valve collaborates with pro players to test maps. They're supposed to report these sorts of findings straight to the Counter-Strike creator, not save them up like a squirrel preparing for the coldest, most famine-ridden winter or an emergency moment in a pro squirrel Counter-Strike match. Coach Devilwalk later confessed that Fnatic had been holding onto that exploit for two months. LDLC appealed their loss, as Fnatic had broken two big rules: no pixel-walking, and no exploits that render textures transparent. However, Fnatic returned fire with an appeal of their own, claiming LDLC had used a different illegal boost. After much deliberation a disappointingly under-prepared DreamHack ruled that a do-over of the whole match was the only fair solution. Before this could happen, however, online backlash overwhelmed Fnatic, and they opted to drop out of the tournament altogether. Problem solved? Hardly. Fnatic will have a lot to answer for in the coming months. But in that moment, it was probably the best (and I use that word in its weakest possible form, perhaps after it's been fasting for a month or has appeared in headlines for hundreds of thousands of list-icles) course of action available. So many highlights. LDLC's Happy was a blur of precision brutality—part-ballerina, part-chainsaw. At the end of the first round, he had nearly double the kills of anybody else. There was also the moment where NiP shot through their own teammate—killing him instantly—to end an LDLC player's hot streak. Down on the scorecards, LDLC then tried the same tactic in a later round. It didn't work, and they just ended up with a pointless team kill on their hands. 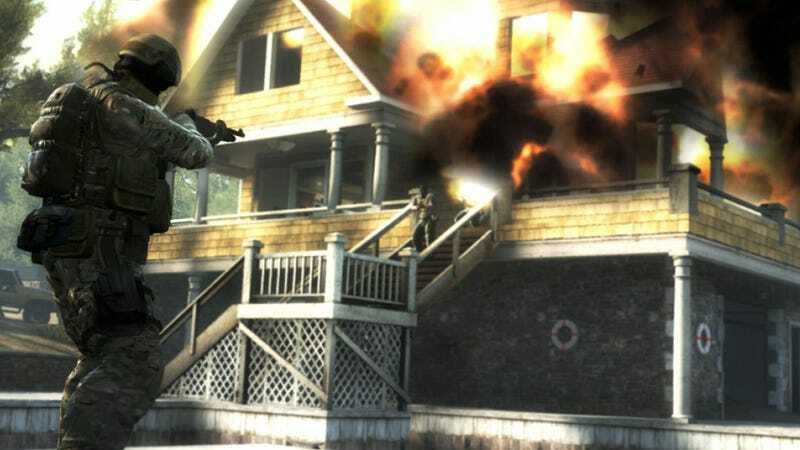 Later, in what was perhaps the best play of the whole game—back on Overpass, because these things practically write themselves—NiP managed to array smoke grenades such that they had a perfect path to the bomb site (one means of victory; the other, of course, is killing everyone on the opposing team) while LDLC was none-the-wiser. In the end, after two grueling halves and down-to-the-wire overtime—a mishmash of bizarre strategies and, eventually, sheer brute force—LDLC narrowly snatched victory (and $100,000) from a team nobody expected to make it this far. While NiP is one of CSGO's most popular teams, they haven't exactly been at the top of their game in recent times. Team captain Fifflaren recently dove from the sinking titanic, with replacement Maikelele taking the wheel only a few weeks ago. The new team lineup had potential, but it wasn't the sort of machine—Terminator-like in its efficacy—these tournaments demand yet. And yet, the new NiP grew in the spotlight. A semi-final match against Virtus.Pro resulted in another one of the best, closest games of the tournament, with players like GeT-RiGhT and f0rest making gorgeous plays while Maikelele racked up kill after kill with terrifying precision. By the time NiP came up against LDLC, it was like watching a whole different team. It was very nearly a crazy Cinderella story, something out of Hollywood. It was a great event, even with some technical troubles on the broadcast, dead air here and there, and of course, the cheating. Doubtless, Counter-Strike: Global Offensive's eSports scene is still in a weird spot, with major teams slinking off in shame right and left, but DreamHack's firework-filled conclusion served as a reminder that there's greatness beneath all the muck. Time will tell how this all shakes out, but I dearly hope we're able to see more matches of this caliber. These moments—where skills, personalities, and stories collide, pushing madly forward, never even chancing a look back—are what sporting's all about. Kudos to RPS, whose report helped me fill in a lot of background details.